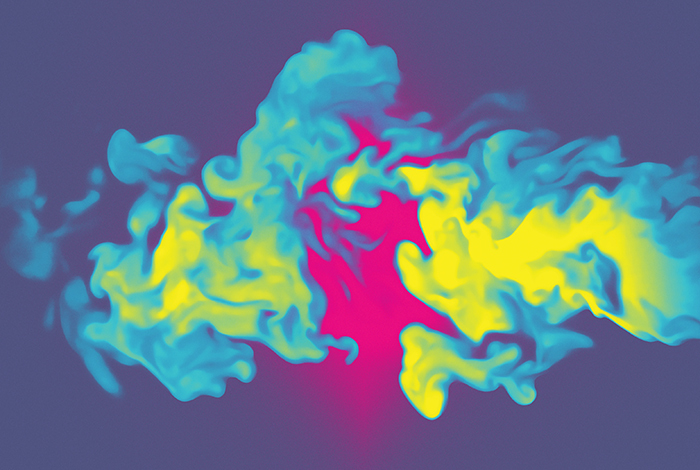 Fluid mechanical studies of turbulence allow computer models to predict the behavior of complex dynamical systems, from tiny fuel capsules for fusion experiments to supernova explosions. Simultaneous density and velocity fields from a turbulent mixing tunnel experiment: colors indicate the degree of mixing between two different-density fluids and vector arrows indicate the velocities of tracer particles in the flow. Los Alamos scientist Kathy Prestridge recently discovered two regimes in which the computer codes might not be getting it right. Even for something as pedestrian as pouring cream into coffee, the equations that govern the fluid dynamics are simply too difficult to solve, even with a powerful computer. Little motions that deviate from computer-model predictions quickly balloon into eruptions and vortices that can end up dominating the whole flow. In fact, some scientists would argue that more is known about the interior of a black hole—a region where no experiments have ever been conducted and, even if they were, their outcomes could never be observed—than about cream mixing into coffee. Or smoke from a snuffed-out candle. Or a gust of wind.